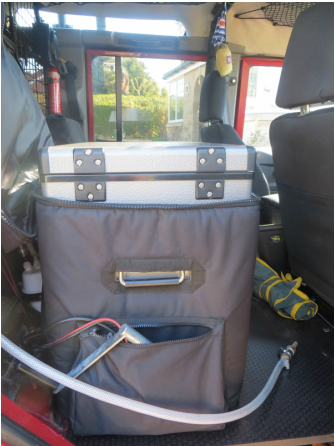 We had decided very early on that we wanted an area at the back of the Landy that we could keep the majority of our kit secure for the duration of our big trip. 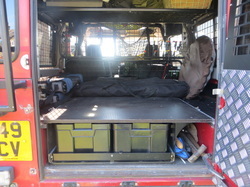 This is the set up in the back of Ruby and it has helped us to become far more organised and safer with our packing. 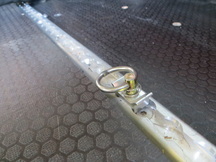 We had a hexagrip board fitted across the wheel arches to provide space for a sliding shelf unit underneath. Decorative, yet functional slip-resistant birch plywood suitable for a wide range of demanding applications. Easily worked / CNC machined, good chemical and weather resistance, plus easy to clean. Edges sealed. Wide range of thicknesses, colours and sizes. Suitable for structural use. There are 2 cargo rails along each side and we have 4 lashing eyes (2 each side) so we can use ratchet straps to secure the load. This really helps stop items slide around and rattling when we are traveling. So when we are fully packed it looks something like this. We use 8 wolf boxes above the shelf, all of which are numbered and everything has its own place! The boxes are made to be stackable with the lids made to interlink with the base of the box above it with 4 latches integrated into the lid to securely lock onto the box. Then there are the 4 smaller Gomo boxes in the sliding drawer. 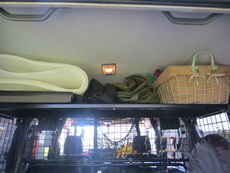 We have also secured a net underneath the load lugger for our sleeping bags/sleeping mats. The sliding drawer system will take 4 smaller size Gomo boxes. There is also a narrow gap that runs down the side of the drawer and we put our spades, bog in a bag stool and other long items in here. We also had chequer plate put on the back door to give it more protection. We are going to have a small shelf fitted to this so we can cook on it. 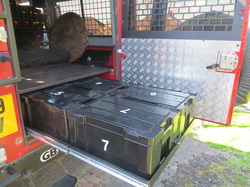 We also fitted a Mantec load lugger in the rear to make use of the space above the wolf boxes. This means that we can keep handy items up there, without having to unratchet loads of boxes! At the moment we keep our ground tent, toilet tent, trasharoo, kneel mats and veg basket up there. We have fitted a load guard and Mantec window guards so the back is more secure. The load guard is useful to mount things onto. We have found nets to be really useful, although we do have a tendency to fill them! 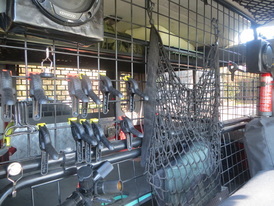 Here you can see our load guard with a fire extinguisher, speakers and a net attached. The pegs are just cheap ones from camping/caravan shows but come in very useful to hang things from the load guard (see kit section for more uses). View of the fridge from the other side. You can see it mounted on the hexagrip and the water pump behind. We are going to remove the rear seat for extra space. 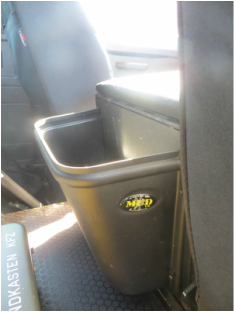 We removed the back seat behind the driver`s seat to fit a hexagrip platform to put the fridge on. The fridge is a National Luna Weekender and is one of our favorite things! It has 52 litres capacity which also includes a small freezer section. We run it off the second battery and from mains if we have electric hook up. The fridge has an insulated cover on it which keeps it at the right temperature. You can also see our water pump and filter behind the fridge and tap. This purifies water from our 45 litre water tank, which is over the rear passenger side wheel. 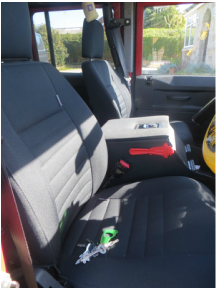 We had 2 new seats and a cubby box from Exmoor trim. The seats are so much more comfortable than the originals and we would highly recommend them. The cubby box is useful to store/lock stuff and also has 2 handy cup holders. We have fitted a mud stuff emergency hammer and seat belt cutter onto the side of the cubby box. We have 2 Odyssey batteries which are controlled by a National Luna dual battery controller combined with the National Luna split charge system. We love stuff from mud stuff! Here is a handy bin although it also gets used to store newspapers and mags too! 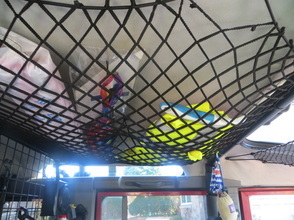 A view of the front roof net and internal part of the roll cage.